Every two years, SeoMoz (now just known as Moz) runs a Ranking Factors study to identify which attributes of pages and sites have the strongest association with ranking highly in Google. This study consists of two parts: a survey of professional SEOs and a large correlation study. The first findings were released this week, with a number of interesting take outs, including the observation that despite Google’s Penguin updates, anchor text correlations remain as strong as ever. In addition, social signals were some of the highest correlated factors, with Google+ edging out Facebook and Twitter, although the survey of professional SEOs suggested that they don’t think that social signals are very important in Google’s overall algorithm. Moz cite this as an area where the correlation may be explainable by other factors such as links, pointing back to 2011, when Moz released their initial social results, showing how Facebook correlations could be explained mostly by links. Moz naturally expect Google to crawl their own Google+ content, and links on Google+ are followed so they pass link juice. Google also crawls and indexes the public pages on Facebook and Twitter. Professional SEOs believe that links are still the most important part of Google’s algorithm, whilst keyword usage on the page is still fundamental, and other than links is thought to be the most important type of factor. In this video Matt Cutts from Google outlines what’s in store in terms of Panda and Penguin updates over the next few months. More often than not, good search engine optimisation is first and foremost about getting the basics right. Does your site have high quality, relevant and unique content? Is your site (and your content) technically well structured and easily accessible for search engine spiders? And is your content clearly signposted for both search engines and your users? I still find in many instances, that getting the basics right in terms of on page optimisation can help many sites improve search engine rankings and visibility. An excellent reference point that illustrates these basics superbly well is an SEOmoz blog post from 2009 entitled: Perfecting Keyword Targeting & On-Page Optimization. The original post which uses research data to demonstrate the importance of these basics, also includes a very simple example page layout, copied below, which shows very clearly an ideally optimised page. Quite simply this is the single most important of all the on-page keyword elements. The page meta title should ideally employ the target keyword or search phrase as the first word(s). Not only is this proven to help rankings but also means that the searcher sees the term they searched in the title of the search result snippet. The page meta description is not used for “rankings” by Google, but is still an important place to use the target search term or phrase due to the “bolding” of the words that appear in the visual snippet of the search results, and because it has also been shown to help boost click-through rate. The H1 tag has always been thought to have great importance in on-page optimisation, and although the original post did question this, it still advised the proper use of a single H1 tag as the headline of the page, preferably including the targeted keyword term or phrase. The SEOmoz study showed that the image alt tag, previously thought to carry little SEO weight, actually had a reasonably robust correlation with high rankings. It is strongly recommended to use a graphic image/photo/illustration on important keyword-targeted pages with the search term or phrase used in the alt tag. It is also suggested to use the keyword term or phrase as the name of the image file. SEOmoz found that shorter URLs appear to perform better in the search results and the closer the target keyword is to the domain name, the better. The advice from SEOmoz was that important keywords should ideally feature in the first few words of a page, preferably the first 50 to 100 words or sooner. In conclusion, it’s critical to get these basic elements of on page optimisation right – and doing so will give you a sound foundation for your overall SEO strategy. Are you a business owner or manager who thinks you should be using Search Engine Optimisation (SEO) to improve your website’s search ranking? Or do you wonder if you should be using Social Media to help improve your business? Does the mere mention of these terms fill you with dread? Or do you just feel blinded with science? And are you just a tad apprehensive about finding the right person or people to help? There are hundreds, if not thousands, of Search Engine Optimisation (SEO) and Social Media agencies and consultants in the market. The overwhelming majority of these do a first class job for their clients, but there are always a few who fail to deliver what they promise, leaving their clients both dissatisfied and even cynical about the industry as a whole. There are also plenty of clients who, if pressed, would confess that they actually know very little about Search Engine Optimisation, or Social Media. Similarly they have no idea how to use these channels and opportunities to benefit their business. Ironically, this lack of understanding can itself hold clients back. And it can also be a contributory factor to the breakdown in the client / consultant relationship. So I’d like to do something different, by offering a workshop based approach to SEO and Social Media. I’ll sit with you, the client, and not only demonstrate how these channels and techniques can be used, but actually action and implement recommendations with you. This approach not only arms you with a greater understanding of SEO and Social Media, but gives you practical advice and guidance in how you can actually do it yourself. My SEO and Social Media workshop sessions are individually planned for each client. No two sessions are ever the same, because every business faces different challenges, and every client has a different level of knowledge and understanding. What’s more, my workshops can help you decide how to best take advantage of the opportunities available – and whether you need more help. A workshop for your business could cost as little as £399. A small investment that could both save you money on expensive agency or consultant fees. And an investment that could generate handsome returns. Instant Previews is a new kind of visual search result using image-based snapshots, which Google say will make it even quicker for users to choose the most relevant search result. Instant Previews provides a graphic overview of a search result with the most relevant sections highlighted, which Google say will make finding the right page as quick and easy as flipping through a magazine. Users will need to click on a magnifying glass icon next to the title of each search result and a visual overview of the page will appear. After this users just need to hover the mouse over any other result to see a preview. The newly customised results should be delivered in under a tenth of a second. Google’s testing found that searchers using Instant Previews are about 5% more likely to be satisfied with the results they click. They say that previews provide a new way to evaluate search results, letting users see the layout of a webpage before clicking the search result – making users more likely to find what they’re looking for. At the time of writing I haven’t actually seen Instant Previews in action, but Google believe that this new visual comparison of search results will help users not only compare results quicker, but also more easily pinpoint relevant content. So, watch this space! 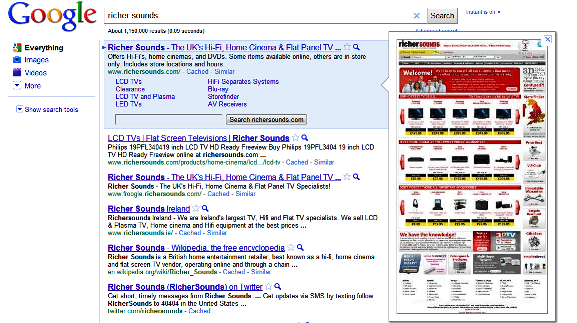 NB: Previews only show on natural results – not ppc ads.